Cameron Mackintosh’s new production of Andrew Lloyd Webber’s “The Phantom of the Opera” opened at the fabulous Fox Theater in Atlanta last Wednesday. Barring some minor flaws, the show largely manages to live up to its legendary status. Much of the credit for the show’s distinction must be given to Derrick Davis (Broadway’s “The Lion King”), cast as the titular phantom. His operatic range matches and even might surpass such feats of musicality as Rob Halford on the album “Sad Wings of Destiny.” Yet, unlike some other notable phantom actors, Davis’s voice lands precisely within that critical deep range that makes the character truly come to life. Davis’s performance excellence is not limited to gracing the theatre with his voice. Indeed, the acting work on display whenever the phantom shows up on stage is tremendous. It would be difficult to find a more captivating portrayal of a tortured, heartbroken artist than the one made manifest by Davis’s prowess in his craft. However, when it came time for the rest of the leading cast to step up to the plate, results varied. Katie Travis, who portrays Christine, possesses near-immaculate singing ability that she exhibited to great effect. However, her acting could be improved upon. 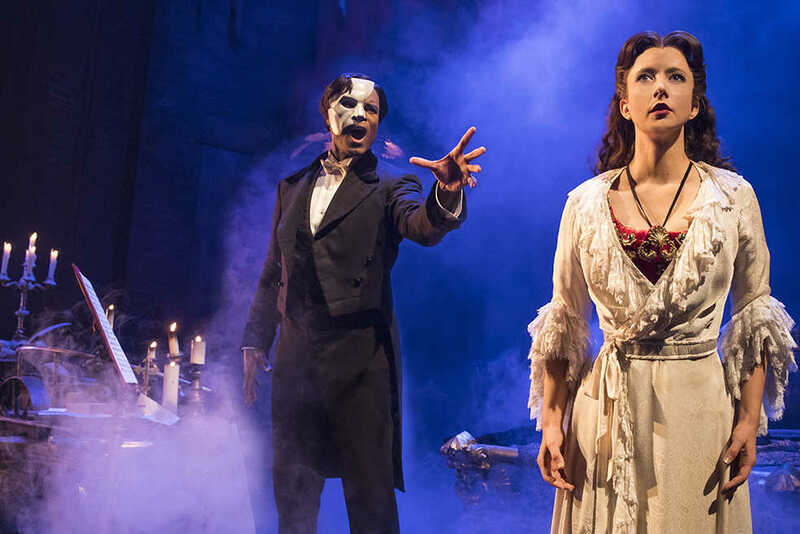 Instead of questioning whether Christine was in love with the phantom or Raoul, the audience might occasionally find themselves wondering if they cared at all about either character. While Jordan Craig’s portrayal of Raoul was without fault, his singing could not compare to either Davis’ or Travis’. This contrast became most apparent during scenes such as that on the roof and also the return to the phantom’s lair, when all three characters were present and singing at nearly the same time. As is necessary in any great production of “Phantom,” the instrumentation and scoring throughout are nothing short of fantastic. The reveal of Lot 666 and the Phantom’s interruption of the masquerade — already worthy of gasps in their own right — become truly magical when married with the incredible musicality that punctuates them. Classic and timeless songs like the main theme and “Point of No Return” hit sonically with the force of a wrecking ball. Elements of the main theme, especially the guitar and bass during the first descent to the phantom’s lair, stand out for their exceptionality. Special effects were effortlessly blended into the fabric of the production. Instead of the usual slow raising of the chandelier from the stage — which occurs in many productions — the chandelier began hoisted and covered. The cloth was then ripped back by some unseen mechanism at the correct moment to reveal a spectacular light show. adaptation. While this detail might not be of much consequence to some, traditionalists will be gratified to know of the orthodoxy of this particular iteration of the production. While some of the sets designed by Paul Brown were excellent and made the audience feel like were a part of the opera, others lacked distinguishing quality. The most memorable set was the phantom’s under-opera house lair, the path to which was formed by stairs emerging from a giant section of wall. The boat looked sinister and moved slickly, and the phantom’s organ looked like it had been dragged straight from Dracula’s mansion onto the ominous set. In addition to being bleak, rather uninteresting and ultimately lacking much in the way of detail, the scenes set on the roof as well as the graveyard tended to drag in comparison to much of the other offerings. Even with the aforementioned minor defective details, Mackintosh’s production succeeds in continuing the tradition of quality for “Phantom,” and the show approaches perfection.